If Jesus is the only way to salvation and you believe that, you follow that for you...I just have trouble with people saying 'I know my way is the right way.' If God is real - and I believe that's true - God is truth with a capital 'T.' You can't talk about an infinite being using finite language. Everybody's belief is, in reality, an assumption. While I sympathize with part of his statement, I beg to differ with his assertion that "you can't talk about an infinite being [i.e. God] using finite language." In essence, he is claiming that God is inaccessible in any full sense to human understanding. What About Being Born Again? 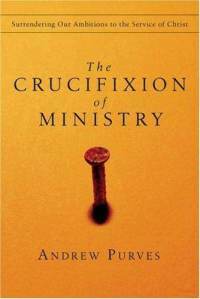 In "The Crucifixion of Ministry" Andrew Purves tells us that Christian ministry is our participation in what Jesus is doing. Thus the primary task of our ministry is to bear witness to Jesus. In that regard, Purves references the Isenheim altarpiece painting by Matthias Grunewald (shown at left). Note the hands in the painting. Our ministry is typified by the hands of John the Baptist (at right) who directs our gaze away from himself to Jesus. At John's right hand are the words (in Latin) of John 3:30: "He must increase, but I must decrease." The New Testament constantly thinks of the parousia in terms of epiphany, for the relation between the today and the eschaton is much more a tension between the hidden and the manifest, the veiled and the unveiled, than between dates in calendar time. What is still in the future is the full unveiling of a reality, but the reality itself is fully present here and now. Epiphany reminds us that with the birth of Jesus, God became God with us (Immanuel). With this advent, the Kingdom is now present to us in the person of its King - unveiled (revealed) to us personally, as we await, in hope, the full unveiling (revealing) yet to come when Jesus returns bodily in the fulness of his glory, ushering in the fullness of his Kingdom in a new heaven and new earth.